Cook pasta shells to desired doneness as directed on package. Drain. Meanwhile, heat oven to 350°F. Spray 11x7-inch (2-quart) glass baking dish with nonstick cooking spray. Heat oil in large skillet over medium heat until hot. Add bell pepper and onion; cook and stir 3 to 4 minutes or until tender. Remove from heat. Add pepperoni, tomatoes and 1 1/2 cups of the cheese; mix well. Fill each cooked pasta shell with pepperoni mixture. Place in sprayed baking dish. Spoon any remaining pepperoni mixture between shells. 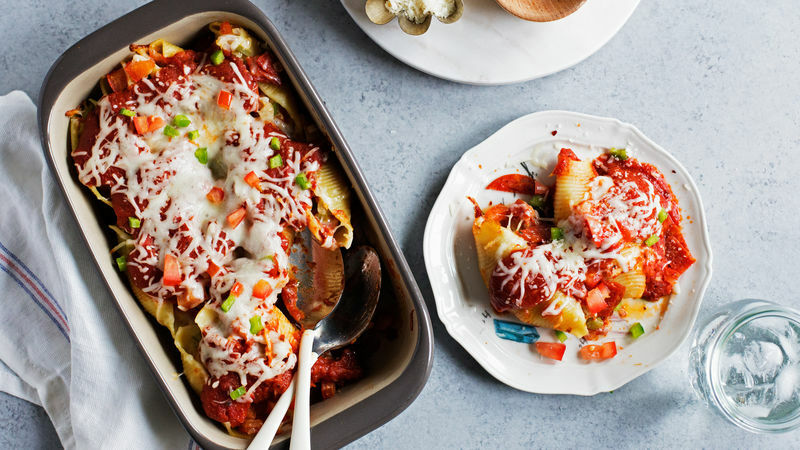 Spoon pizza sauce over stuffed shells. Cover with foil. Bake at 350°F. for 30 minutes. Uncover; sprinkle with remaining 1/2 cup cheese. Bake an additional 5 to 10 minutes or until sauce is bubbly and cheese is melted.